Taduno is a musician from Nigeria living in exile. He sang songs against the military regime and had to flee. He was beaten so badly his voice was affected and he can no longer sing with the sweet voice that made him famous. Somehow he has been allowed to live in an unoccupied house, undisturbed, welcomed even, by the people of a foreign town. Then he receives a letter from his girlfriend Lela, telling him that everything in Nigeria has changed. How could she know where to find him? The letter doesn’t even have an address. Fearing what has happened, Taduno goes home to Lagos where no one recognises him, not even his neighbours who lived beside him for decades. And Lela has disappeared. Without his voice, Taduno is nothing. He can’t sing for Lela’s freedom, nor can his song of rebellion reawaken a nation. 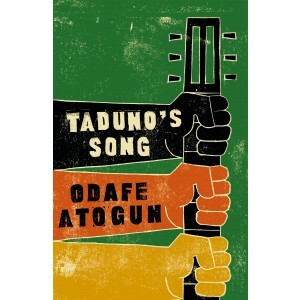 It is exceedingly difficult to create a narrative like this, to build something allegorical out of the mess of the world, but Odafe Atogun succeeds in creating a spellbinding novel that I hope will reach huge audiences. Taduno’s Song is a terrifying but beautiful story about the power of myth and how people can make their own freedom if they question and act upon what it actually means to be free. Perhaps in real life there aren’t the miracles afforded to legend, but those freedoms are still worthy of sacrifice. Next week I’m reading Here I Am by Jonathan Safran Foer.